It’s a sunny autumn day here in Milan and the rays are filling our apartment with warmth and radiance. The air is crisp and fresh and it seems to be universal laundry day in my building as many of our neighbours have their loads hanging out to dry, a habit which I have found difficult to pick up, due to my germaphobe nature perhaps, prefering to hang mine indoors and away from the dust. In so many ways I’ve adapted to the Italian way of living, hand gestures and all, and I’m becoming a little more “Italian” with every passing day. At the same time though, I will always be a Canadian girl, from a Lebanese family, and will always be considered a “straniera” (foreigner) here in Italy. I spent most of my life in Canada and I can hardly recall my early childhood in Lebanon, save for a few vague memories and stories told to me by my mama. My sister and I had a humble upbringing by a wonderful single mama who raised us to be strong independent women, showered us with love and food and taught us to be grateful for the opportunities we would have just by being able to call Canada our home. Yet, in my teen years, I could hardly wait to grow up and leave Canada. I dreamt of a European life. I had never been to Europe at the time and only ever seen it in films and heard stories from my mother’s friends who had travelled to Europe. It was all so romantic and I longed to one day stroll down the Champs Elysée with a baguette in hand and to eat gelato in Rome. Then, life happened. I went to University, met a boy and abandoned my dreams of living abroad until one day, single, in my late 20’s, with a bucket list that barely had a dent in it, I decided to change my life. I picked up and moved to Italy. It was the craziest thing I had ever done, completely out of character, but I needed it, my sould needed to feel alive and it was one of the best experiences of my life. Oddly enough, I didn’t meet hubby until two years later, after I had moved back to Canada. He was living the same experience I had, in reverse. He had picked up and moved to Canada. We clicked, perhaps because we understood each other, two years after that we were married, and the rest is history. We now call Italy home, but the thought of moving back to Canada is always in the back of our minds. While I love our life in Italy, the art, the history, the ease of travelling, the milder climate (good bye Canadian winter) and the variety of produce available year round, Canada will always be home in so many ways. 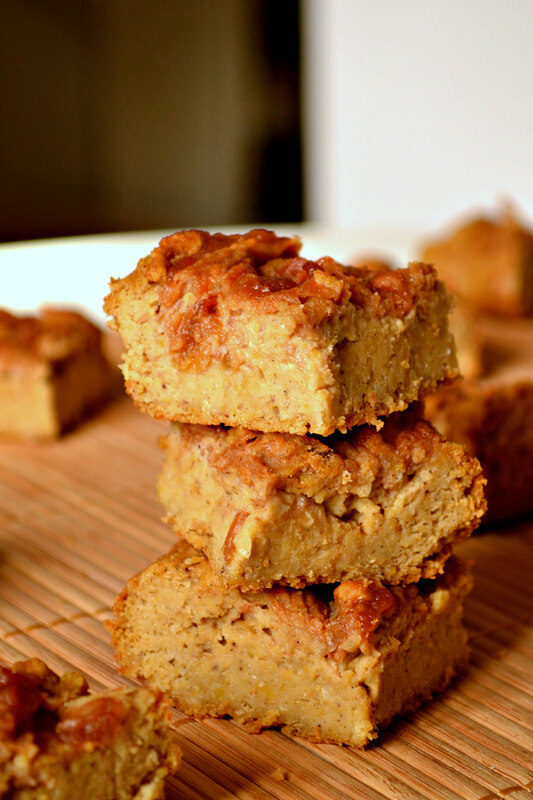 I’m not sure where all of that came from, it just rolled off my fingertips as I sat down to write this post and it doesn’t have much to do with the recipe, except perhaps for the fact that I used Italian apples, Canadian Maple Syrup and Tahini to make these blondies. It’s a stretch I know, but let’s just call it a fusion of all my cultures if you will. These blondies are so tasty that I ate about 5 of them immediately after I took these pictures, I kid you not. The recipe is an adaptation of my Chewy Chickpea bars. They are very lightly sweetened with maple syrup and the natural sweetness of the apple butter which doesn’t have any added sweetener in it at all. If you like your sweets really sweet, you might want to adjust the sweetener amount, I’ve added a note in the recipe to account for that. In hindsight, some chopped pecans would have gone really nicely mixed into the batter here, so I’ve added it as an optional item. The Chickpea. Garbanzo Bean. Ceci Bean. Hummus. The humble little bean. Call it what you will, it is a super star. It makes a wonderful Hummus bi Tahini spread, a delicious snack or soup/salad topping when spice rubbed and roasted and goes great in bars and blondies. Yes it does. Participants in a recent study were found to consume fewer snacks and fewer overall calories when supplementing their regular diet with garbanzo beans. They were also found to report greater food satiety, with experiences of reduced appetite and greater food satisfaction. We look forward to some large-scale studies in this area, and we expect to see a clear role being carved out for garbanzo beans in terms of weight loss and weight management. Along with their unusual combination of protein and fiber and their great ability to stabilize digestion, garbanzo beans also stand out as a food that is moderate in terms of calories. At approximately 270 calories per cup, we’re talking about 10-15% of daily calories. In return for this moderate calorie cost, we get 50% of the DV for fiber and 29% of the DV for protein. Those nutrient amounts are great trade-offs for anyone struggling with weight loss or weight management. These blondies are made with a chickpea base that is flavoured with tahini, slightly sweetened with pure Canadian maple syrup and marbled with a pure and natural homemade apple butter. The result is a nutrient dense treat that you can feel good about eating. Recipe adapted from my Chewy Chickpea Bars. Whiz all the ingredients together in a food processor, except for the apple butter and pecans, if using. If using pecans, gold them into the batter. Pour the batter into the lined loaf pan and spread it out evenly. 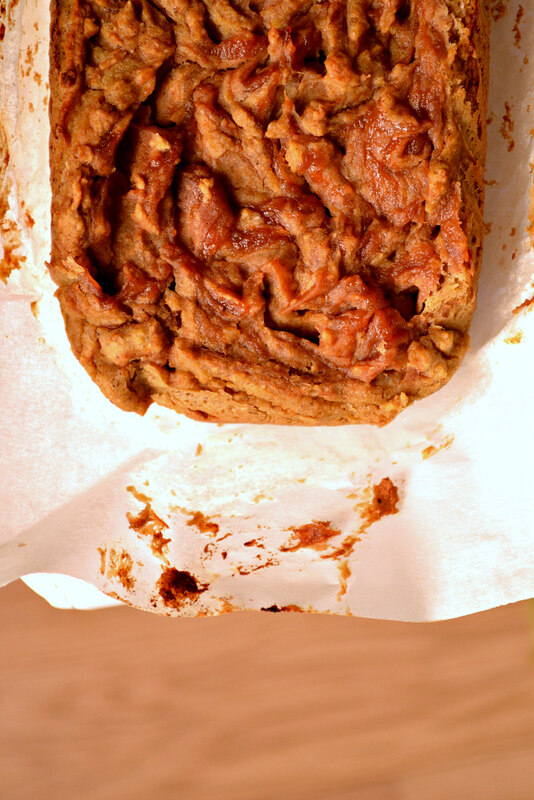 Dollop 4 tablespoons of apple butter on top and swirl in using a knife or chopstick. Bake for 30 minutes. Remove from oven and let cool in the pan for at least 30 minutes and then remove from pan and let cool completely before slicing. * this recipe is sweetened to my liking, so if you have a sweet tooth, you might want to increase the amount of maple syrup by 1 or 2 tablespoons. If you do, be sure to reduce the amount of milk you use accordingly. These look so fudgy, I love them. 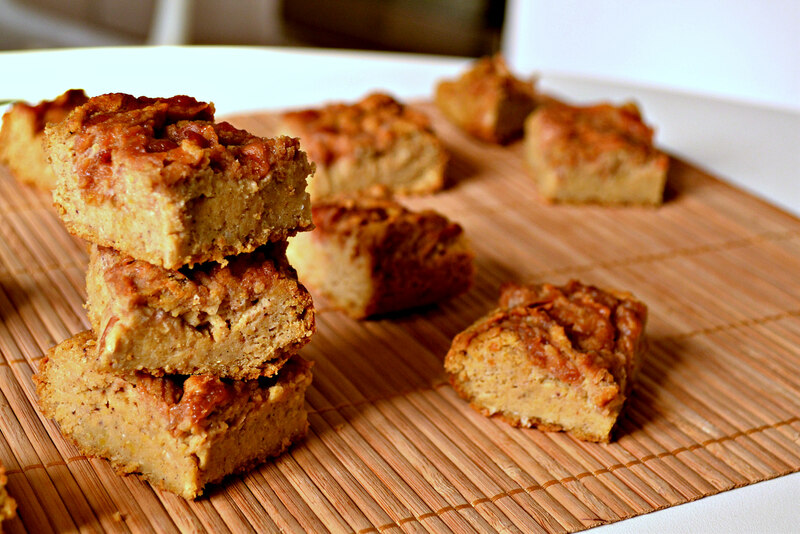 I’ve seen a lot of chickpea blondies but have never gotten brave enough to try one, haha! I’m not a big fan of chickpeas in general because they are so strong, but I love that you added tahini and apple butter, that is so awesome! I’ve never tried apple butter before but since they are my favorite fruit, I’m sure I’d love them! Thank you Brandi. I won’t lie, you can taste the chickpeas, but not in the way you can taste them in a savoury dish, it’s more subtle. I’m sure a little extra sweetener woud mask the taste a bit more. Apple Butter is so delicious and so easy to make. Take a look at my recipe for it if your up for making it. I use a lot of cinnamon which I know you love. OMG Audrey…mashed potato nice…bahahaha. That’s the most hilarious analogy I’ve ever heard. To be honest every time the topic of moving back comes up, it’s the cold and long winter that nips it in the bud. We’re scared!!! And to think I grew up in Ottawa. My eyelashes would freeze when I walked to school. As soon as I got in the door they would thaw out and drip…true story. These sound incredible, I LOVE all the flavors combined!!! Thank you! I hope you try them out. I moved to Canada from London, UK 3 years ago and it has been such a disappointment. Canada is so behind in every way. Apart from being a safe county I dont have anything positive to say about this corrupt and God forsaken place.